So was the Pitchfork Music Festival a successful three days of indie-rock and hipster utopia? Did it send us reeling? Did the experience cause fans to have any sensual after-rock effects from all the sun-drenched melodic mayhem? Did the fans conquer the festival and leave with their live music-obsessed souls soaked in pleasure or pain? And will we ever forget the chaotic concert fan drama that ensued before headliners Pavement took the stage to wrap-up the festivities? As I headed to Union Park for the final day, I still had the glorious visions flashing before my eyes and euphoric feelings swimming around in my head from Day Two, most notably LCD Sound System’s transcendent show. So, yes, the bar was set high for the Pitchfork Fest finale. And for the most part, the entire festival was another success as it was in its previous four years. But not just because of the musical experiences. We give this year’s festival two-thumbs up because of the collective power of a perfectly planned concert fan provocation AND a series of sizzling sets that left jaws dropped and booties shaking. These are just some of the highlights from a weekend packed with micro-moments I’ll be thinking about for months to come. As expected, both Beach House and St. Vincent played sets that felt like 10,000 angels came down from heaven and flew across my face. And seeing them both perform for the first time outside in the midday sun added a brighter almost shimmering nuance to their music that I didn’t feel or hear before. The combined effect was woozy, wistful and perfectly delivered considering the lazy and hazy conditions all weekend due to the heat. And if I was to separate the sets into their own specific emotional experience, I would say that Beach House doused us gloriously in dreamy operatic visions of sorrow, peace and love via organ, drums and guitar. 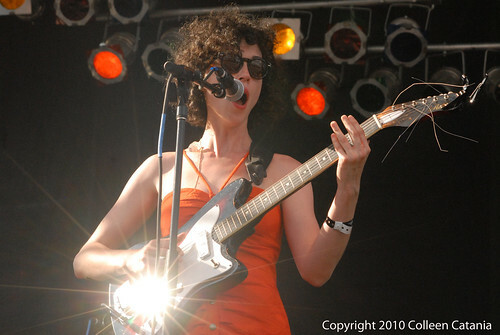 And St. Vincent, led by Annie Clark who donned a bright yellow dress and comical circle shades, took us by the ears and heart and led us on a voyage to a dark place where delightfully deranged Walt Disney characters tell creepy sad stories and exorcise the demons of relationships past. And it was a grand time to come full circle with a Live Fix experience and actually really see St. Vincent this time. For anyone who likes to shake it like a Polaroid picture, it’s still hard to listen live to just one half of Outkast . 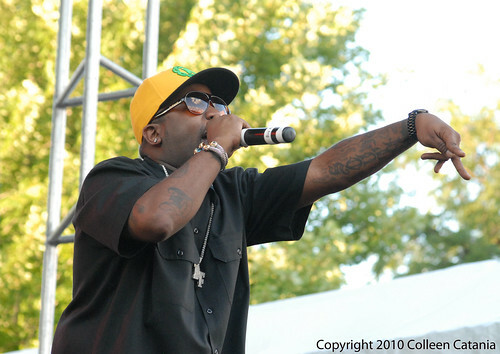 But Big Boi made it really easy to forgive the absence of Andre 3000, even if he did arrive a bit late to the show and reportedly jumped on stage a minute after his tour bus arrived. Backed by a live band, a DJ and a soul-seething horn section, Big Boi fed off the crowd’s energy and dished out tracks from his latest solo effort Sir Lucious Left Foot… The Son of Chico Dusty , a string of club-bangers and funky ghetto anthems (Follow Us & Shutterbug); plus a few crowd-pleasing big, bouncy and bass-rattling party jams. During each song, he slipped in and out all his playful pimp-inspired personas to deliver the expected “Ms. Jackson” ballad and other Outkast classics. Lightning Bolt wins the award for the best surprise band of Pitchfork 2010. I knew absolutely nothing about this duo, that is until they unleashed an epic 45-minute set roaring with drums and bass that rolled right across my entire body like an mighty Midwestern thunderstorm full of hard rain and pelleting hail. I’m proud to say that I am now a fan and have since gone back to see what I’ve been missing. Before Big Bio went on it was time to take in Major Lazer ‘s carnival of freakish madness and mayhem. First, I ran over to the stage because someone said that there were Chinese Dragons on stage. But then Lazer, and his duo of supporting dancing hype-ladies, poured it on using WWE-ish entertainment antics, the best of which was when he jumped from the top of a ladder into the snarling pit of fans in the first row. We can thank DJ/producer Diplo for providing the sonic foundation for the set via a mashup of frantic garage, techno and house beats. But in the end, all eyes were on Lazer as we all watched with eyes wide open as he flew his freak flag high and made fans go nuts. Picking up where the stand-up comedy on Friday Night left off, I laughed my way towards the end of Pitchfork as Rocking Ryan Murphy, the shock jock from Q101 during the 90’s, introduced headliner Pavement with a hilarious tribute that was predetermined to riled the masses and get everyone fired up and pissed off. 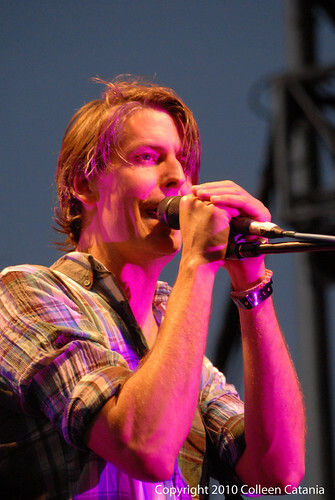 According to various sources, Murphy was allegedly asked by the band to come up and introduce the Pavement because Murphy was one of their biggest supporters when other radio stations wouldn’t play them in the early 90’s. And as you watch the video below you’ll see just how rage-ready fans got. You can’t tell completely by watching the video, but things got nasty closer towards the stage. 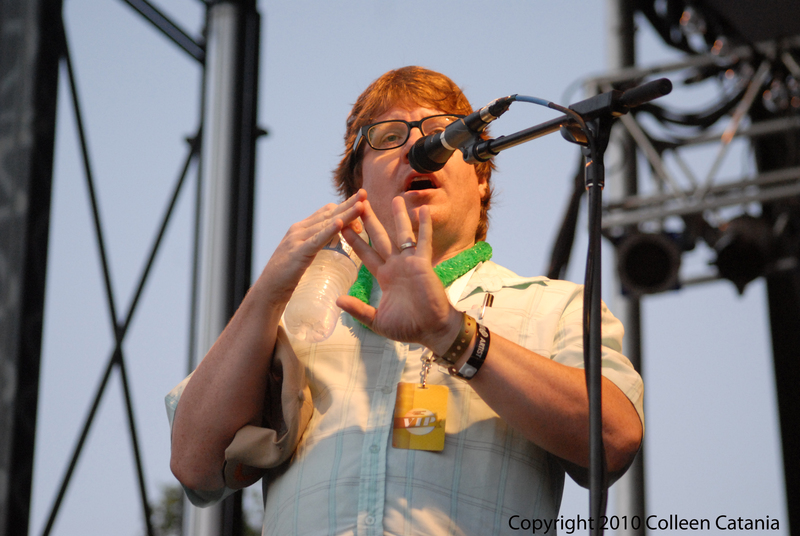 And according to Colleen, who was in the pit getting ready to shoot Pavement, during Murphy’s 5-plus minute rant fans expressed their growing dissatisfaction and started hurling bottles at Murphy, two of which hit Colleen in the head. Thankfully Colleen is a true soldier, and even though she was caught in-between Murphy and the brooding fans who had had enough of the his remember-when nostalgic trip, she came out of the pit okay. All ridiculousness considered, I have to say that Murphy’s speech is a real classic fan moment. And it’s certainly one of the best of 2010. It’s also one of the most entertaining intros for a band that I’ve seen in a long, long time. I couldn’t stop laughing at some of the crazy stuff Murphy was saying, so here’s a few of my favorite quotes. And, yes, there is a bit of some naughty words in the video so watch (and enjoy) with caution. After I did a bit of YouTube research, I had the pleasure of discovering an old video of Murphy doing a similar provocative shpeal for a previous Pavement show back in the early nineties. No, I’m not a sadistic jerk, but nonetheless I love it when artists and comedians test the limits and play with the minds of concert fans in this way. This is really brilliant stuff for anybody who can appreciate it. This latest bit of Pitchfork news came in on Monday via Greg Kot from the Chicago Tribune. As if the weekend needed any more drama surrounding Pavement, Kot reported that due to an alleged dislike for Pitchfork’s editorial staff in the past, a certain member of Pavement asked that their Sunday show not be streamed online even though most of the other shows at Pitchfork Music Festival were. Yes, this seems like a lame thing to do, especially for a band like Pavement who didn’t get their props back in their hayday. Why stop more fans from discovering them now? And like I said, it doesn’t make much sense on the band’s part. But as Kot points out in his report, asking Pitchfork not to stream their show wasn’t something that only Pavement took part in during the Festival. Indie-rock darlings Broken Social Scene and Big Boi also choose not to have their concerts streamed online via Pitchfork website. Why kept fans at home from watching online? Sure, that sounds like a reasonable explanation. And it’s also an explanation that stirs the pot on the long-lasting debate over whether or not the internet is killing the music industry or keeping it alive. My take on this situation is that especially with a festival like Pitchfork, where independent bands are trying to grow their audience and reach new fans, I would think that it would make complete sense for a band to say YES to live streaming their concert. That said, I don’t think band’s like Big Boi, Broken Social Scene, or Sonic Youth during Pitchfork’s 2007 festival, are doing their fans any favors when they choose not to have their show live-streamed. Letting fans watch from home is not taking anything away from fans who paid for tickets. If anything, it stops new fans from discovering the band online and getting excited about going to see the band live. And when you think about it, it’s an un-wise counterproductive move for any band in this day and age, when touring is where most bands make their money. 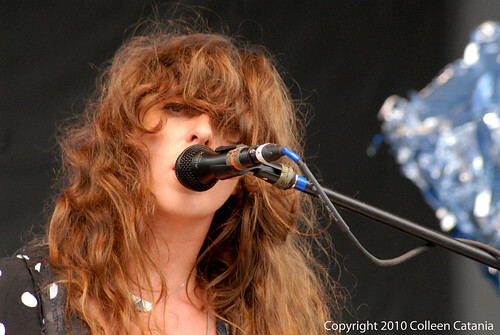 Well, folks that wraps up our daily coverage for Pitchfork Music Festival 2010. But remember to stay tuned for our special post about how we experimented with Layar and augmented reality during LCD Sound System’s set on Saturday night, and our interview with a concert fan from Rock for Kids. Check out Colleen’s full set of Pitchfork Music Festival 2010 photos. Thanks Max. I was hoping someone would help out with that 😉 Were you at Pitchfork 2010?